Now it’s time to set up the spine. Now that the hips and legs are complete, it is time to work on the rest of the torso and the arms. We will start by creating the robot’s spinal column. Keeping bone hierarchy in mind, our strategy for creating the spine will be to create a chain of bones that travels along the torso to represent the spine. That chain will begin at the hips area. Before we do that, let’s talk a little more about the spine in terms of a real life human and then in terms of rigging a model. A real human spinal column is composed of 33 smaller bone segments called vertebra. These vertebrae protect the spinal cord, while also allow the spinal column to flex with a certain degree of rigidity. An illustration from the book Gray’s Anatomy showing a side view of an entire human spinal column. 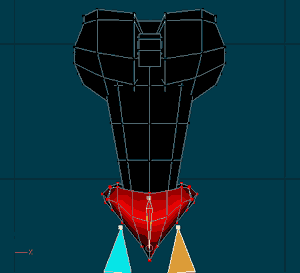 A 3D model of a humanoid torso area should not need nearly as many bones in its geometry rig. Remember, we only need to create the illusion of realism (or at least a level of realism that the audience can relate to. 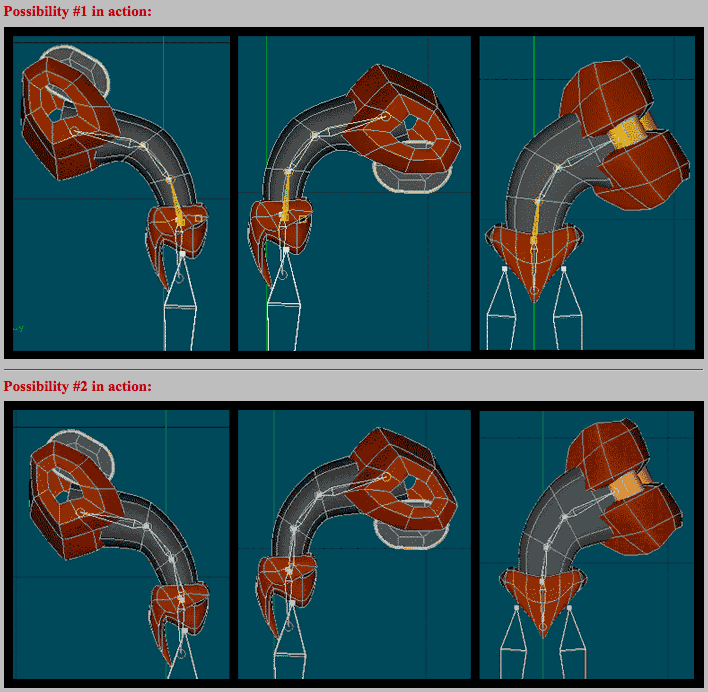 At the same time, The animator will need to be able to manage the character’s rig to give a performance. Having to deal with 33 bones directly or indirectly for just one section of the body is unnecessary work for an animator in a typical case. For the robot model that we are working with now, we’ll be able set up the spine and get by just fine using only three geometry bones. I’ll explain my reasoning later on this page. Here we are selecting all of the groups inside of the “Torso” groups folder. We are going to hide all of the geometry except for the torso section. We are going to do this because we don’t need to see any other part of model right now. This will make it easier for us to just focus on the torso. 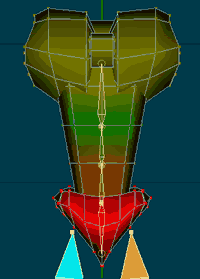 Switch to Modeling Mode in the Model window for the Rig Training Robot model. Go to the Rig Training Robot model in the PWS and locate the Torso folder in the model’s “Groups” folder. 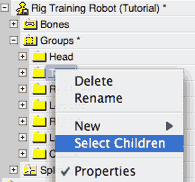 Right-Click on the Torso folder and select “Select Children”. This will simultaneously select all of the groups that were placed in the Torso folder. Now the torso area has been selected and we should hide everything else now. Once the selection is made, click on the “Hide CPs” button on the Modeling toolbar. This will hide all of the CPs that are not currently selected. The hips have already been assigned a bone but it is a good idea for us to keep them visible for this part. In order to prevent ourselves from accidentally reassigning the hip CPs to a spine bone, we should lock the hip CPs. 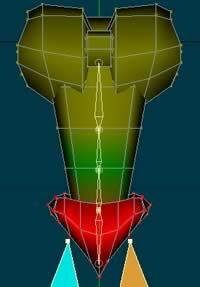 So in the Modeling window select all of the hips CPs (or in the PWS select the model’s hip group). Then choose the “Invert Selected” command from the “Edit” menu bar option or use the keyboard shortcut which is “.” (period) key. Everything else is hidden now and I’ve locked the hips’ CPs so that I don’t accidentally assign them to spine bones that we are about to add. This will select everything except the hips. When that happens click on the “Lock CPs” button on the Modeling toolbar and the hip CPs will now be locked. We’re back in Bones Mode and now we need to decide how to layout the spine. 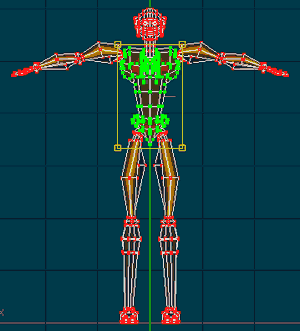 Now it’s time to start adding the spine bones so it is time to switch back into Bones Mode. Let’s study the model’s spline layout to get a better idea of what we are working with here. Each model may require a different number of bones than others depending on the model’s complexity and spline layout so what’s best for one model may not always be best for another model. 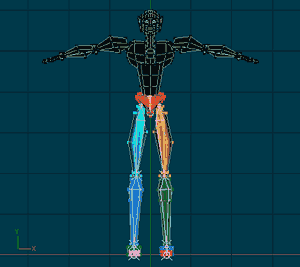 With humanoid characters, you’ll probably find that three geomety bones are optimal for setting up the spine. I mentioned earlier that we could set up the spine in this model by using just three bones. 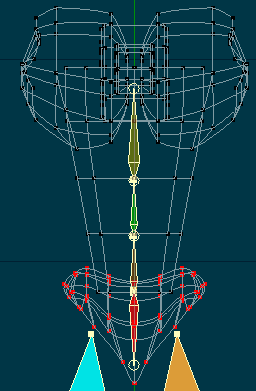 First, the spline layout at the waist/ abdomen area is very simple. It looks like the waist was was built by taking a ring of splines and extruding it four times (if you look in the wire frame you can see this.) There is nothing complicated about this at all so there is no need for a complicated solution. Torso in wireframe view Same view but in wire frame view. Second, I don’t have a script in my possession that ever calls for this particular robot to do anything out of he ordinary with his spine. 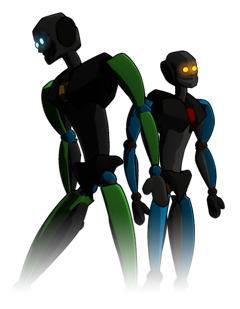 For that reason I don’t need to make his rig do anything beyond what a standard humanoid type rig is expected to do. Third, you could really make this spine with just two bones. Each spine bone would control about half of the torso each. Unfortunately the results don’t look as good as they could with this particular model. And finally, another look at this mesh may suggest to you that if you used more than three geometry bones you may not get any better results/ control than you would by just using three. We also need to take a look at this section from the side. If this sounds a little confusing then hopefully it will make more sense when we really add the bones. We are going to do that right now. Here is how I placed the three spine bones along the torso. From the side the bones are centered within the mesh. We are going to start with our first spine bone. That bone will originate from the hip bone area. We are going to make this new spine bone a child of “(GEO) Hips”. We are not going to attach this spine bone to its parent of “(GEO) Hips”. After that we will create the second spine bone as a child of the first one. When that is done, we can make the third spine bone as a child of the second spine bone. With this spinal column I am making sure that none of the bones are attached to each other because I do not want an IK chain for this spine. Select each of the spine bones one at a time and if the “Detach Bone” option becomes active in the Bones toolbar then go ahead and click it to detach the bone. We don’t need these bones attached because later on in a later tutorial we’ll be setting up a spine control rig to easily control the spinal column. 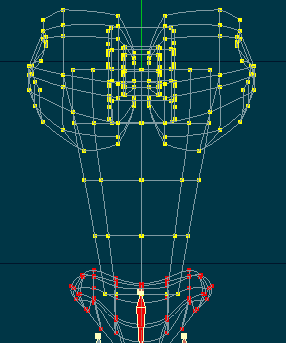 From the front the bones are centered along the ‘X’ axis. 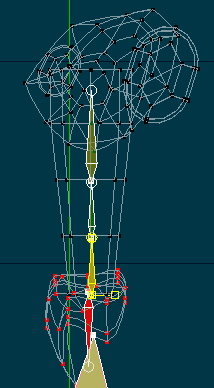 Also make sue that each bone is centered within its area of the mesh. I’ve decided to point the roll handles of the spine bones towards the back of the model. The tips of the spine bones are pointed upward since the base of the spine is at the hips. Change the names of the bones for the spine to something more descriptive if you have not already. Also make sure that your hierarchy is correct. Give the spine bones a descriptive name so that you can keep track of them in the PWS. Go ahead and make sure that your hierarchy is how we intended it to be. Now we’ll assign the spine bones to the CPs. I’m not really sure yet about which CPs we should assign to the bones but I have two possibilities in mind. Here is the CP assignment for Possibility #1. Assign the CPs spline rings to the tip of the spine bone that is closest. 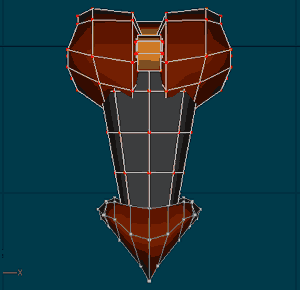 Here is how the mesh deforms when I rotate the bones to curve the spine. Bending forward, backwards, and to the side. Here is the CP assignment for Possibility #2. Assign the CPs spline rings to the base of the spine bone that is closest. When I compare the results I prefer the way Possibility #2 deforms when I bend the spine bones. So I will stay with #2. That’s it! We are finished with the spine.